The dust has settled from one of the busiest world title fight weekends in recent memory and we kick things off in boxing mad America, where the west coast action took place last night at The Forum in the Los Angeles suburb of Inglewood, California. Venezuela's master boxer Jorge Linares, 43-3 (27), looked great early on in his defense of the WBA lightweight crown against Britain's former Olympic gold medallist Luke Campbell, 17-2 (14), dropping the challenger in the second round. 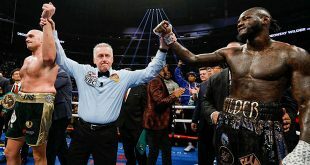 Campbell beat the count and managed to stave off the champion and by the fourth frame, the taller southpaw began to get the timing of Linares' punches and started to trade with his antagonist on even terms. Linares definitely had difficulty with his younger challenger in the later rounds but used his experience to reserve enough energy for a spirited effort in the final frame, convincing two judges to award him winning scores of 115-112, 114-113 while a third judge had Campbell ahead 115-113. Linares keeps his belt by split decision and has now notched two consecutive defenses of the WBA title he won from Anthony Crolla in 2016. The former featherweight and super feather world champ has now won 12 bouts in a row and is reported to be heading into a showdown with undefeated WBC lightweight king Mikey Garcia. Despite losing to Linares, Campbell showed that he belongs on the world stage during his first appearance against a true world class opponent and the Yorkshireman will likely gain another championship shot on the strength of his performance last evening. Heading over to the American state of Texas, a world title clash at cruiserweight occurred between WBA champion Yunier Dorticos, 22-0 (21), of Cuba and Russia's Dmitry Kudryashov, 22-2 (21), at The Alamodome in San Antonio. With a vast majority of both fighter's previous victories coming by knockout, this was a contest that was unlikely to go the distance and that turned out to be true in the second round. From the opening bell, Dorticos looked to be the better boxer, using distance and a sharp jab to open up Kudryashov for whipping right hands. Initially, Kudryashov caught most of the champion's punches on the gloves while getting closer and landing a few shots on the inside, but the challenger was mostly kept on the defensive by the aggressive Dorticos. The second frame saw Dorticos up his activity, snaking looping rights just around the challenger's guard and the cumulative affects of the shots were clearly wearing down the resistance of Kudryashov. The Russian finally collapsed after taking a full-blooded right hand to the jaw and while he made it to his feet by the count of 10, the wobbly Kudryashov was judged to be in no condition to continue by the referee. As this was a bout in the World Series of Boxing tournament, next year Dorticos will meet the winner of the upcoming IBF title clash between champion Murat Gassiev and challenger Krzysztof Wlodarcyzk. Earlier on Saturday, there was a battle for the WBO heavyweight strap between reigning champion Joseph Parker, 24-0 (18), of New Zealand and Britain's Hughie Fury, 21-1 (10), in England's Manchester Arena. The taller Fury was expected to use his reach advantage against the harder punching champion and the challenger did just that, staying away and flicking out a jab, keeping on the move and tying up Parker whenever the champion gained proximity. It looked like the game plan that Tyson Fury, Hughie's cousin, used to great affect in upsetting reigning divisional champion Wladimir Klitschko in 2015, but Tyson added a lot more offense to the brew, attacking Klitschko whenever the "Dr. Steelhammer" was off balance. Hughie wasn't able to add that part to his approach and that made for a fight against Parker with very little action. Parker tried to get to grips with Fury, but aside from a few moments where the champion landed meaty shots, the Kiwi experienced 12 rounds of frustration. Parker won two of the cards by wide margins of 118-110 while a third judge couldn't pick a winner at 114-114, allowing the champion to retain his WBO belt. While the wide scores for Parker were controversial, don't expect a rematch. There were two world title clashes on Friday, both at The Convention Center in the American city of Tuscon, Arizona, where Gilberto Ramirez and Oscar Valdez retained their belts. Towering WBO super middle ruler Ramirez, 36-0 (24), had the unusual experience of facing a taller opponent but was able to outlast challenger Jessie Hart, 22-1 (18). 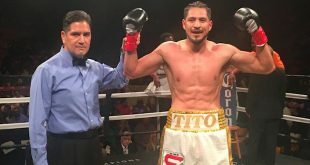 Mexico's Ramirez was dominant early on, canvassing America's Hart in the second round but the challenger was able to regroup. The pair went at it tooth, fang and claw over the rest of the contest, each landing hurtful shots in a fight that saw many turns of tide. 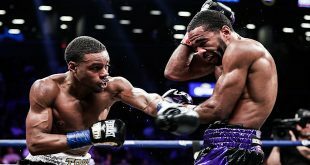 The success of Ramirez in the early going turned out to provide the champion with the edge he needed to sweep the scorecards 115-112, 115-112 and 114-113. Hart should see another world title opportunity on the strength of his big-hearted effort and will probably capture world honors after having picked up valuable experience against the gritty Ramirez. WBO featherweight boss Valdez, 23-0 (19), of Mexico was also put to the test as he engaged in a close quarters slugfest with challenger Genesis Servania, 29-1 (12), of the Philippines. Valdez was the boss early on but was nailed with a hard shot in the fourth that dropped him but the champion roared back to return the favor to Servania in the fifth frame. The rest of the bout featured roaring two way action with the judges favoring the higher activity rate of the champion Valdez, who won by surprisingly wide scores of 117-109, 116-110 and 115-111.